"Every journey begins with small steps. All Runners are beginners and at one point or another, we are all on start line. Running keeps you young and Movement is the best form of medication." Pre marathon EXPO and BIB allotment will be done on previous day, Saturday 5th January 2019. Each runner will be provided with a BIB number with Time chip , T Shirt / Cap, Snacks and a Goody bag. 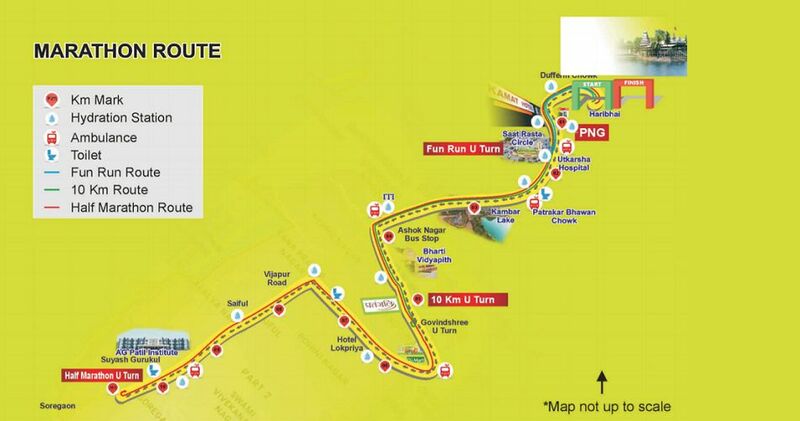 The gun time for Solapur Half Marathon will be 5.40 am. This is one of the best routes with a good ,smooth and adequate running surface and is surrounded by some landmark educational Institutes and residential areas. The cheering students and citizens from these areas will be a great source of encouragement and motivation for the runners. This smooth surface with occasional up-hills and down-hills and the lovely January weather would serve as a perfect setting to set some new running records to boost the spirit of running. Solapur has also produced several talented sportspersons who have created their mark both at national and international levels. WINNING DOESN’T ALWAYS MEAN GETTING THE FIRST PLACE IT MEANS GETTING THE BEST OUT OF YOURSELF. So LET’S RUN TO BREATHE FRESH AIR, TO EXPLORE OURSELF AND TO ESCAPE THE ORDINARY. Inspired by this, Solapur Runner’s Association is arranging 2nd edition SOLAPUR MARATHON on Sunday 6th January, 2019 in the textile city of Solapur. CNS SOLAPUR MARATHON event is being organized by the Solapur Runners Association (SRA), a non-profit organization formed by a group of enthusiastic runners from Solapur city. The SRA is formed by some highly influential members of the society who are successful in their respective professional fields. Majority belong to medical fraternity and are from different subspecialities. ABILITY, MOTIVATION ATTITUDE: If you make them work together, you can achieve great things. A small group became a team of dedicated runners and fitness enthusiasts and started motivating each other and their friends and family to RUN to stay HEALTHY. Motivation is what gets you started and HABIT is what keeps you going. What began as a occasional run became a habit and these members envisioned a dream to hold this unprecedented event with a soul purpose to nurture health awareness in the society and to bring the local community together for a common cause. 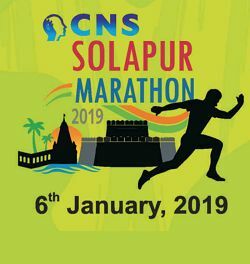 The SRA aims at organizing this event ‘ CNS SOLAPUR MARATHON 2019’ in the most professional manner, abiding by the required protocols and necessary technologies for the successful completion of this mega event. It aims to provide a platform for the runners from local and surrounding cities and also to encourage citizens to take up running as a form of regular exercise to maintain good health. The SRA firmly believes that SOLAPUR MARATHON will be organized as a regular annual event for many years to come. City is located in the South Western region of Indian state of Maharashtra. It is well connected by Road and Rail Routes between Mumbai-Hyderabad and Mumbai-Chennai. Pune ( 240 km) and Hyderabad ( 300 km) are the nearest metro cities. Solapur is well known for its textile industries and also for it’s pilgrimage destinations like Akkalkot, Pandharpur, Tuljapur etc. Solapur is also famous for the Great Indian Bustard Sanctuary where this rare bird , also known as Maldhok is found. It is a major medical hub catering the border districts of Karnataka and Andhra Pradesh. January is a festive month due to Sankrant, a major local festival dedicated to Lord Siddheshwar and has a pleasant weather well suited for distance running. Provide us with a secure email ID/mobile no that you can access regularly, since this will be our primary means of communication during the run up to the event. Users of email services that offer filtering/blocking of messages from unknown email address should add this email id registrations@runindia.in to their address list. Please fill out only those fields that are necessary for mailing purposes. Do not provide redundant data in multiple fields (i.e., do not list the same data for city, province and country), as this will only complicate our ability to contact you, if necessary. You are aware that running long distance running is an extreme sport and can be injurious to body and health. You take full responsibility for participating in the Solapur Marathon-2019 event and do not hold the organizing committee or any of it’s members or entities responsible for any injury or accident. You agree that Solapur Marathon 2019 shall not be liable for any loss, damage, illness or injury that might occur as a result of your participation in the event. You may acknowledge and agree that your personal information can be stored and used by Solapur Marathon 2019 or any other company in connection with the organization, promotion and administration of the event and for the compilation of statistical information. You confirm that, in the event of adverse weather conditions, major incidents or threats on the day, any of the force major or restriction by authority, the organizers reserve the right to stop/cancel/postpone the event. You understand that confirmed registrations and merchandise orders are non-refundable, non-transferable and cannot be modified. runINDIA is only a service provider and is not in any way responsible for the delivery of the event. 1) Have given true and complete information in this application form and me/my ward is/am solely responsible for the accuracy of this information. 2) Have fully understood the risk and responsibility of participating in the Solapur Half Marathon or any event outlined in this application (collectively "the event ") and will be participating entirely at my/his/her risk and responsibility. 3) Understand the risk of participating on a course with vehicular traffic; even if the course may be regulated/policed. 4) Understand that I/my ward must be of, and must train to, an appropriate level of fitness to participate in such a physically demanding event and I/my ward have obtained a medical clearance from a registered medical practitioner, allowing me/my ward to participate in the event/s. 8) In case of any illness or injury caused to me/my ward or death suffered by me or my ward due to any medical reasons or medical condition during the race or at any time thereafter as a result of the event, regardless or not whether such medical reasons or conditions shall have been pre-existing conditions known by me or my ward and further regardless of whether I/my ward shall have disclosed, at any point in time, the existence of such reason or condition to any person, none of the sponsors of the event or any political entity or authorities and officials or any contractor or construction firms working on or near the course or any of the Solapur Half marathon committee persons , officials , members of Solapur Runners Association or volunteers or Haribhai Devkaran prashala staff members and their volunteers or any persons or entities associated with the event or the directors, employees, Agents or representatives of all or any of the aforementioned shall be held liable by me/my ward or my/my wards representatives. 14) I/my ward understand and agree to the event terms and guidelines.